After serving the minimum 9 years of a 33 year sentence for botched armed robbery, 70 year old O.J. Simpson has been granted parole. The transiting south node in Aquarius has just begun transiting the 6th house, the transiting north node in Leo has just crossed O.J.’s Ascendant and now begins transiting the 12th house. The transiting moon in Gemini forms a conjunction with natal Uranus (the parole hearing and official judgement). The transiting moon forms a gibbous opposition to Saturn which aspects Juno, the contract asteroid. He must wait until the minimum 9-month sentence is served, which is October. At that time, Saturn will be direct and in an exact opposition to his 10th house natal Uranus (freedom). The solar eclipse of August 21, 2017 (28:52 Leo) falls in O.J.’s first house. 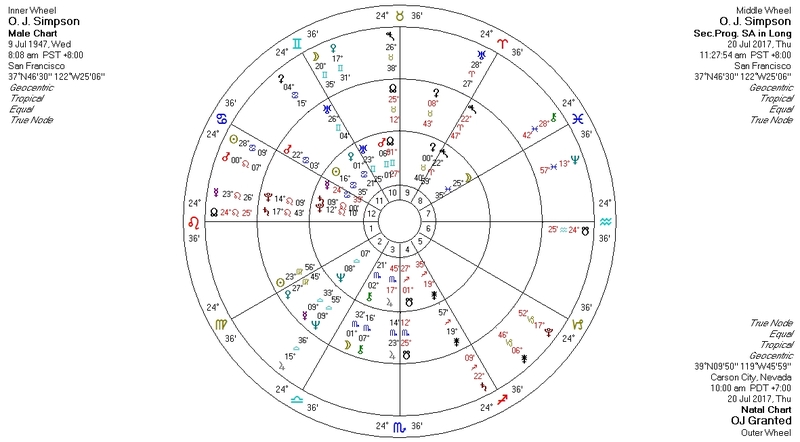 Transiting Uranus retrograde (28:27 Aries) trines the eclipse from the natal 9th house (freedom).